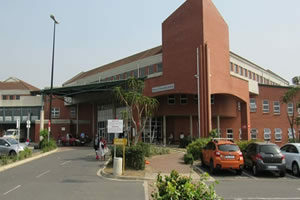 King Dinuzulu hospital complex (formerly King George V hospital) is situated in Springfield in Ward 25 of the eThekwini health district. In 1939, King George V Jubilee Hospital was officially opened with 139 beds for the treatment of Tuberculosis patients. . It was designed to accommodate all races, but was found that the total number of beds was insufficient, which resulted in the wards being divided between European, coloured, and Indian patients. The Black patients were only being accepted for admission with regards to special investigation and treatment only and others were still required to be hospitalised at the “Point” Non-European Hospitals. Due to the start of the World War II, six months after the opening of the Hospital, there was no prospect of expansion for eight years. The world war produced a wave of industrial development in the cities, and a lack of proper living conditions for labourers newly recruited from the districts. This caused a tremendous growth of T.B. in South Africa. In 1945 the war came to an end and by 1946 the military was in the process of evacuating Springfield Military Hospital. As it was adjacent to King George V Jubilee Hospital, the government decided to take it over as an extension. The wards were equipped and opened for services. By 1956 the Springfield Hospital had been taken over and both hospitals were combined with a total number of 1291 beds and became known officially as King George V Hospital. Psychiatric services were added to the activities and the scope of services expanded over the years to include Thoracic surgery (T.B. cases) and Spinal surgery. Oesophageal carcinoma was added to the services and the most recent inclusion was the family planning clinic (tubal legation / vasectomies).